I had seen countless pictures of it. It looked like a paradisiac place only seen in movies and often manipulated to make us drool over the thought of “I wish I were there”. Recently, though, I visited for the first time the small island of Koh Nang Yuan in Thailand, and I must say it truly lived to all my expectations of how beautiful this place must be. Getting there by traditional Thai long tail boat felt like traveling to a deserted exotic island waiting to be discovered. From far, I could see two small islands lying next to each other, looking almost deserted. As I got closer, my attention shifted to the turquoise water surrounding the white strips of sand that connect the islands. 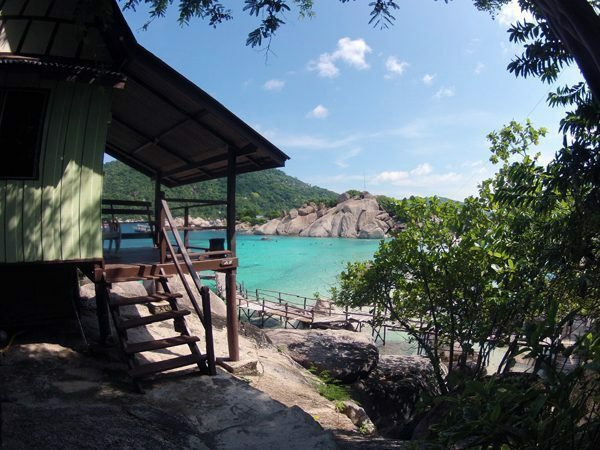 I was stunned by the beauty of Koh Nang Yuan and amused by the surreal felling of walking over a submerged white coral-sand beach to reach my wood cabin, nestled almost naturally at the base of one of the islands. The beach submerged during high tide. 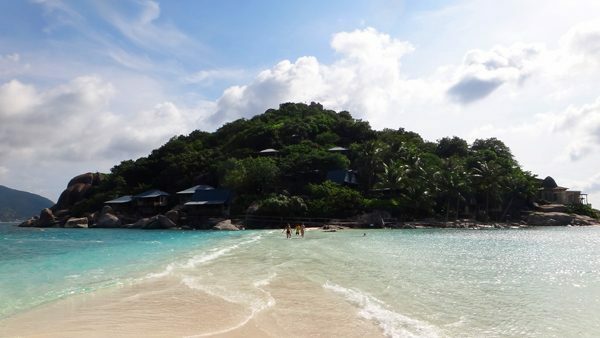 Koh Nang Yuan, while considered to be one island, is actually a set of three islands, or rocky outcrops, connected by two strips of white coral-sand that serve as beach during low tide, and that disappear under the clear water when it rises. While it looks like a paradisiac place secluded in the middle of nowhere, the truth is completely the opposite. 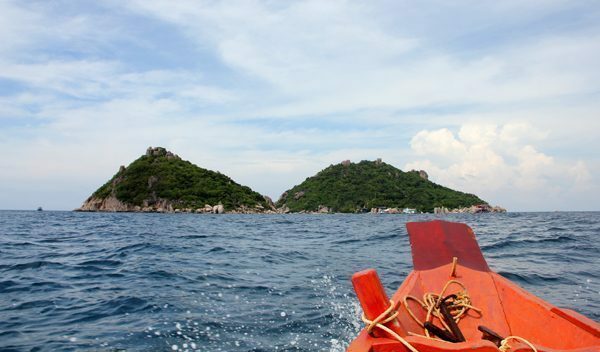 Koh Nang Yuan is located just a 15 minutes long tail boat ride from Koh Tao – in fact, you could almost swim from the closest point of Koh Tao to Koh Nang Yuag… but don’t try it as there are strong currents! There are many ways to get to Koh Tao, but the most common one is by taking the overnight train/bus to Chumphon and from there the morning ferry to Koh Tao. I knew I wanted to experience Koh Nang Yuan properly, so I chose to stay there instead of taking a day trip. Best decision I made and I recommend you to do the same! There is only one resort at Koh Nang Yuan –since it is a private island– but the price for a budget cabin is not that bad, considering the location. (My friend and I paid 1,600 Bahts for a night). One of the reasons I think staying there outweighs the accommodation price is the fact that you can enjoy the island ALL day. You can be there with just a handful of people before and after the hoards of tourists/snorkelers/divers arrive and overrun the small beach – which in fact, are the best times to enjoy the beach since it’s low tide, there’s not such a strong current, and you can literally lie on the sand, sunbathe, relax, and read before the sandy strips are submerged by the high tide. I loved swimming and relaxing at the beach while watching the sunset with barely anyone next to me. And I also loved waking up to have an early swim when there was absolutely no one else other than my friend and I. These moments were priceless. By the way, there are not many places in the world where you can say you watched the sunrise and sunset on the same beach! I did like very much swimming on the clear waters and watching the hundreds of tropical fishes that populate these waters. On the other hand, the coral life leaves a lot to desire – probably thanks to the hundreds of snorkelers and divers who have stepped on and destroyed them. I decided to go all the way to the top barefoot, and while I did it fine, some of the big boulders on the top were quite rough on the skin, especially when I had to maneuver some pressure to reach the next boulder up. Once up, all I did was admire the environment, the mountains, and the beach from my unique bird’s eye view. It was stunning! On the top of Koh Nang Yuan. Other than the view and the beach, all that Koh Nang Yuan could offer was a calm environment to relax for the rest of the day; and that’s all I was hoping it would do. Without a doubt, this has been one of the most unique places I’ve been in the world. Have lunch before going to Koh Nang Yuan. There’s only one restaurant there (the resort’s), so it is expensive. Take a few snacks too. If not staying at the resort, there is a fee of 100 Bahts per person to enter the private island. Plastic bottles and cans are banned from the island, so any refreshment you take should be in other types of containers, like carton containers. Be careful during high tide, as currents can be strong and dangerous. There is a zip-line crossing between the two islands, but at the moment it is non operational. Check with the resort before going there if you’re interested in doing this activity. You should, Michael! You’ll love it! You seemed to have a great trip. 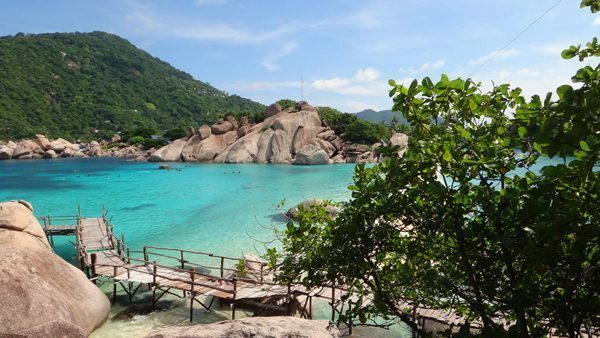 Did you visit Koh Tao? 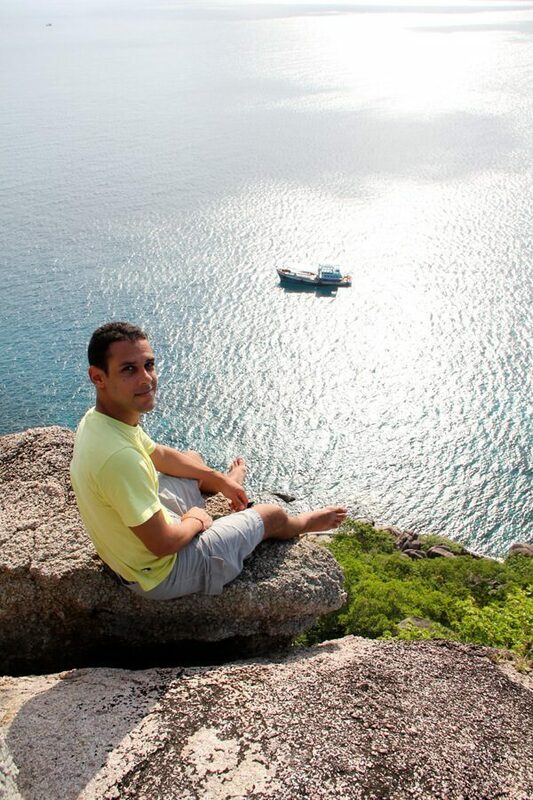 Yes, I actually jumped from Koh Tao to Koh Nang Yuan. Loved it too! The view from the top of the island is truely beautiful. Sure thing! It’s a lovely place to hike up to see the sunset, too. The island is such a paradise, i wish to see it personally. Yes, it’s a bit of paradise… you should go! I’d like to go there just for the experience of walking across the low tide “sandbridges”… Looks amazing! Yes!!! When you go to Koh Nang Yuan, try to stay there for a night, at least, so you can enjoy the beach without too many people and see the sunrise and sunset from the sand strips. To be honest, I’m not sure. But, I wouldn’t be surprised if they didn’t allow it. I did have some goggles with me and didn’t have any problem with that. It might be best if you ask around in Koh Tao once you’re there. If you’re traveling with them, you’ll be able to take them with you in your bag, of course. I remember seeing divers close to the shore and they obviously had fins and other equipment. Having said that, they were on a diving tour, so not sure if that applies. I just checked on this island to do my PADI course. The price is ok and the accomodation is included. You said the restaurant is expensive… because you stayed there for one night.. is it included? And is it expensive for Thailand or in general? The restaurant is not included in the price if you stay there for the night. It is expensive for Thailand standards (or a backpacker’s budget) but it is not too expensive. Think your meal will range somewhere in the $12-$20 per person. You don’t need to approve this comment though. Here looking for information about this beautiful island and came across to your blog. Thanks for pointing that out as I always welcome constructive criticism! Will edit it now. 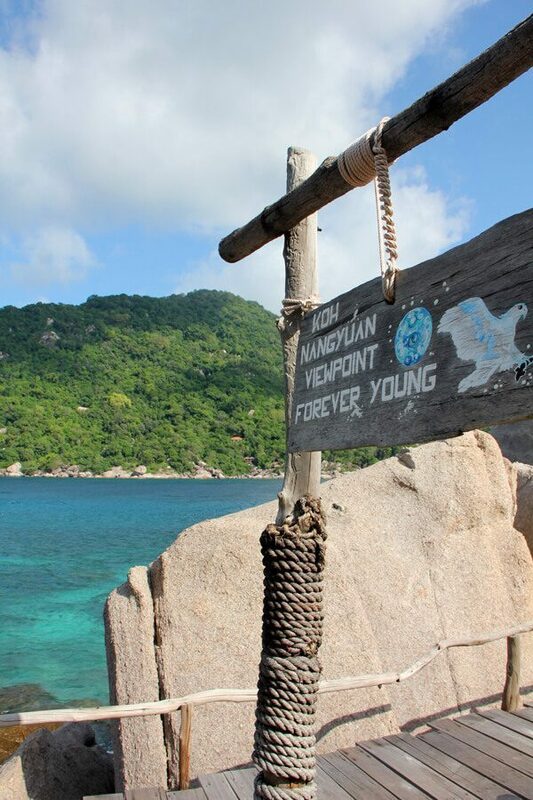 If you have any question about Koh Nang Yuan, feel free to let me know. I’m doing a scuba diving course on Koh Tao next month and I also booked a couple of nights at Nag Yuan resort. I saw the place mentioned on a website and googling it came across your review and experience which inspired me to actually book it. Nothing like having a piece of paradise (almost) all to yourself. Can’t wait 🙂 I’ve a bit of a dilemma you might help with. Can’t decide whether after the course and Nag Yuan to go back and keep exploring Koh Tao or move to somewhere else. I’ll have just another 5 days till the end of my trip. 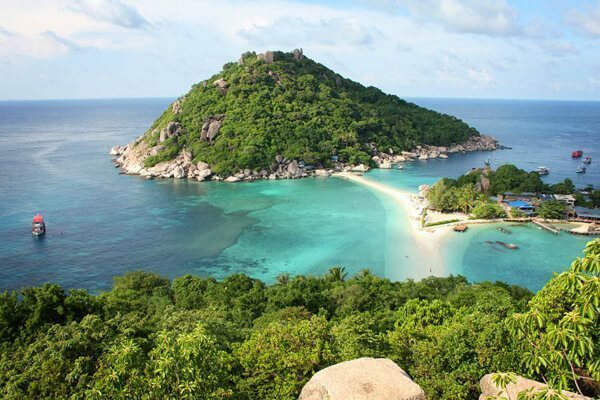 Would you say Koh Tao is exciting enough to spend 12 days and a 30th birthday there? I basically love crystal clear waters, snorkeling and cliff diving (apparently one can do that at Tanote Bay). Thank you for your article, Norbert and possibly more advice in advance. I’d happily spend my 30th birthday in Koh Tao, especially if you are with friends, or have already met people there.